A carer is someone who provides unpaid help and support to a relative, friend or neighbour, who could not manage without that help due to frailty, long term illness, disability or addiction. A young carer is an individual under the age of 18 whose life is in some way restricted because of the need to take responsibility for the care of someone who is ill, has a disability, experiencing mental distress or is affected by substance misuse. Young carers are a vulnerable group as they are more likely to miss school, have lower educational attainment, struggle financially, and not be in education, employment or training (NEET) between the ages of 16 and 19. It is estimated that there are 36,621 Carers in Wakefield District; of which only 6,700 are known to services. Carers UK suggest that Nationally, Carers save the economy £132 billion per year; resulting in Wakefield contributing over £700 million. According to research; there are estimated to be 700,000 young carers in the UK; only 150 of those are recorded on Wakefield’s local database (held by the Youth Service). An estimated 1 in 8 people in the UK are carers; 1 in 5 people aged 50-64 are carers. The number of carers in the UK is rising, and it is predicted that 3 in 5 people will be carers at some point in their lives. There are 4.27 million carers of working age living in the UK (57% women; 43% men). Approximately 2.3 million people in the UK have given up work in order to care for a loved one, and nearly 3 million people have reduced their working hours. Carers providing high levels of care are more than twice as likely to suffer from poor health compared to people without caring responsibilities. As at the last Census (2011), in Wakefield 2,586 children and young people (aged under 25 years) were recorded as being a carer, this is 2.8% of the population aged 0-24 years. The proportion of carers in Wakefield is higher than the average for England (2.5%) and the region (2.5%), but is not significantly higher. Data shows that the proportion of young carers in Wakefield has not changed much since 2001, when 2.7% of children and young people were recorded as carers. 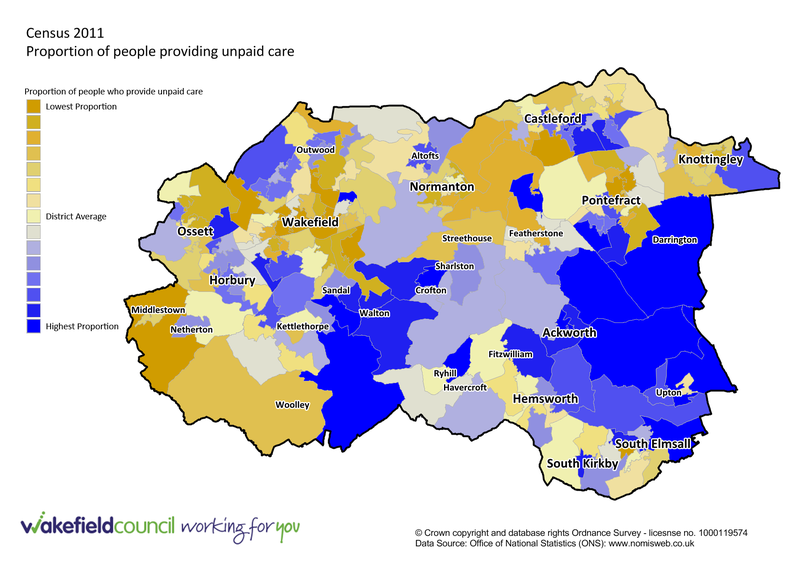 The map below shows the proportion of people providing unpaid care within the Wakefield District. The highest proportion of unpaid care (shaded blue) appears to be delivered within the more affluent areas of the District, such as: Sandal, Walton, Ackworth, and Darrington. People residing in deprived areas are more likely to be eligible for receiving support from services, due to their low income, and therefore do not provide a lot of unpaid care. Whereas, the affluent areas tend not to be eligible for support care, and comprise of elderly residents; therefore a large proportion of carers in these areas are next of kin and therefore have no expectation to be paid to care for their loved ones. 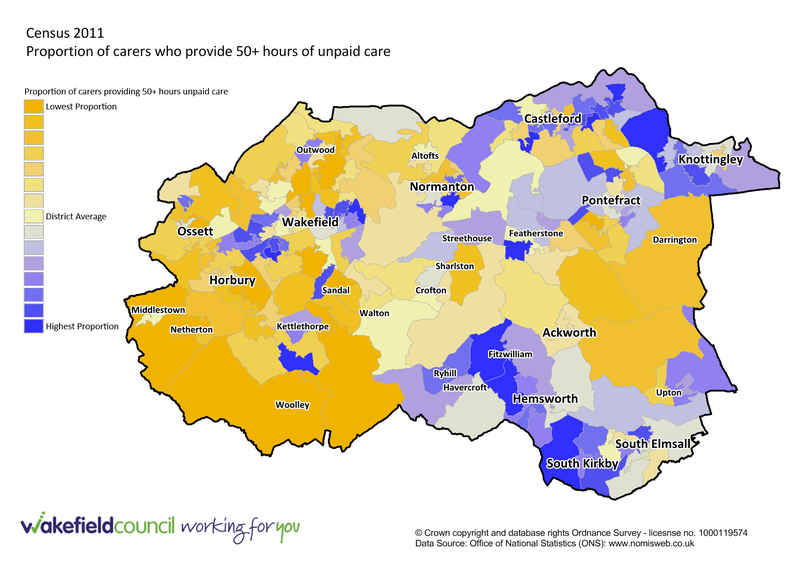 The map below shows the proportion of carers who provide 50+ hours of unpaid care within the Wakefield District. The highest proportion of people receiving 50+ hours of unpaid care (shaded blue) appears to be predominantly identified within the more deprived areas of the District, including areas of Knottingley, Fitzwilliam and South Kirkby. Whilst there is a smaller proportion of people in deprived areas providing unpaid care, those who do are more likely to spend over 50+ hours of unpaid care. This suggests that there are some sections who have a very high level of need and are unable and/or unwilling to access services. Whereas the affluent areas are more likely to buy in additional support to accommodate demand. It can be difficult for carers to see their caring role as separate from the relationship they have with the person for whom they care, whether that relationship is as a parent, child, sibling, partner, or a friend. The challenges of these caring responsibilities take on many forms. Many carers juggle their caring responsibilities with work, study and other family commitments, and as a consequence of this; have difficulty separating their caring role from their actual relationship that they have with the person for whom they care for; whether that relationship is as a parent, child, sibling, partner, or friend. The roles and responsibilities that carers have to provide varies widely; ranging from help with everyday tasks including getting out of bed, and providing personal care such as bathing, to emotional support such as helping someone cope with the symptoms of a mental illness. Some carers, in particular younger carers, are not known to be carers. They don’t tell relatives, friends or health and care professionals about their responsibilities because of a fear of separation, guilt, pride or other reasons. Research has shown that there is a slight increase in the awareness of carers, and Wakefield Council are currently being proactive to promote this issue, but as can be seen in the headlines; a significant number of carers are not identified, and therefore are not in receipt of the support and services available. The Children and Families Act 2014 identifies that young carers have the right to be assessed, and the Local Authority have a duty to assess ‘on the appearance of need’ (without a request having to be made). This act also significantly strengthens the rights of young carers. Prior to the act coming into force during April 2015; many Local Authorities were not undertaking young carers assessments. Whilst we do not have this level of detail for Wakefield; we can assume similar outcomes for the district as per the UK figures and challenges mentioned below. 1 in 12 children in the UK are estimated to be young carers. Approximately 39% of young carers reported that nobody in school was aware of their caring role. Young carers are 1.5 times more likely to have a special educational need or disability than their peers. The average age of a young carer is reported to be 12 years old. According to the 2011 census; there has been an 83% increase of young carers aged 5-7. An estimated 68% of young carers said they were bullied in school, due to their caring role. It has been recognised that young adult carers, aged between 16 and 18, are 50% more likely to be not in education, employment or training (NEET) than their peers. On average; it is reported that young carers miss 48 full or part days of schooling per year. Local data from the 2015 Children’s Survey indicates that 15% of Year 5 pupils and 9% of Year 9 pupils care for someone in their home that has a serious illness or disability; 2% of primary pupils said that this caring role takes up more than two hours of their day. Pupils who reported that they were a carer were also more likely to report that they had tried smoking that they have been offered drugs, that they have tried drugs and that they have been bullied. Comparing Wakefield to other LA’s and England. The below demonstrates the current position in Wakefield in relation to our Yorkshire and Humber neighbours across several of the key carer indicators. Wakefield is currently similar than the England average for many indicators (those indicators coloured yellow). You can click on the “trends” option below to explore the trends in the various measures. Wakefield Youth Work Team (WFYOUTH) coordinate and deliver a programme of high quality youth work for young people aged 11 and above to fully prepare them for adulthood; equipped with the personal and social skills to be valued and engaged as citizens, capable of making positive choices and accessing opportunities. The ‘Wakefield Early Support Advice Information and Liaison Service’ offer support for families, including Young Carers, who are caring for a child or a young person, aged 0 to 25 years old, with special educational needs or a disability. You will find lots of useful information within the Carers Wakefield & District website; they offer support and groups for Young Adult Carers aged 17 to 25. School Nursing offer health assessments for Young Carers: email bdh-tr.schoolnursing@nhs.net for more information. You can learn more about the services for Young Carers in Wakefield and the support that is offered to help alleviate pressures on mental health, including education and leisure opportunities HERE. Young Carers Pathway – this document identifies what actions practitioners should take when they identify a young carer, and where to get additional support. A child or young person under 18 with significant caring responsibilities; where they provide or intend to provide care for another person of any age, except where that care is paid for or carried out as voluntary work. For short and long term support (SALT), this refers to someone under 18 with significant caring responsibilities for an adult. The definition of a carer is taken from the Carers and Disabled Children Act 2000, which utilises the following description: “Carers (aged 16 and over) who provide or intend to provide a substantial amount of care on a regular basis for another individual aged 18 or over“. Although the Act only refers to carers aged 16 and over, younger carers of adults should be included in this return. The Act excludes from the definition of a carer, paid care workers and volunteers from a voluntary organisation. It is possible for a client to have more than one carer, and for a carer to additionally be a client in his or her own right. Indicator of client’s responsibilities for caring for another person, i.e. ‘carer’; or ‘not a carer’.